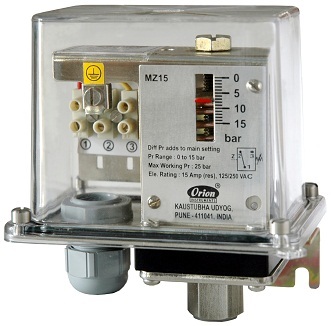 MZ OEM pressure switches are housed in a tough polycarbonate IP 66 enclosure and are intended for outdoor use. The repeat accuracy is better than 2 % FSR. a choice of cable entries can be fitted to the enclosure. An internal earthing is provided. Terminal strip for wired ends is provided inside the enclosure. Pressure port is 1/4” BSP standard.